Lock, Shock, and Barrel are a trio of little kids who serve as secondary antagonists in The Nightmare Before Christmas. They love causing mischief but they’re not as heartless and devilish as they seem. It’s just that they’re really intimidated by Oogie Boogie and will do whatever it takes to appease him. After all, they’re only kids. If an adult bully threatens you, wouldn’t you do anything to stay on his good side, too? 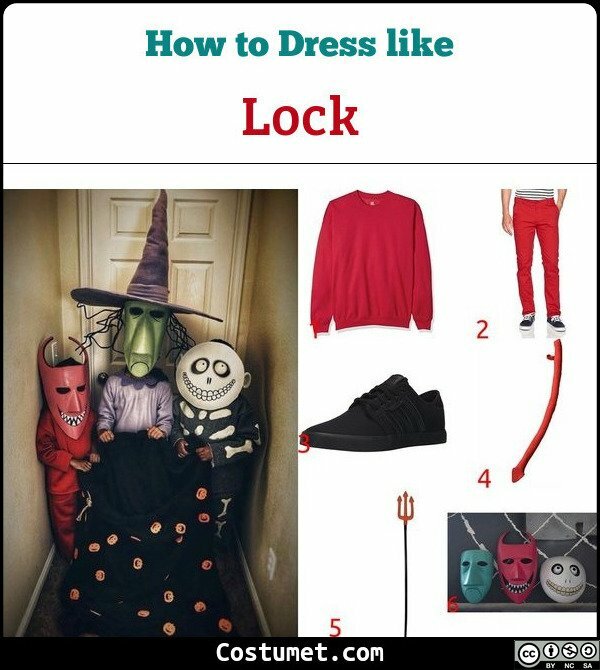 Lock, Shock, and Barrel look like trick or treating kids. Lock loves his red devil costume complete with a devil’s tail and pitchfork. Shock prefers looking like a witch with her purple dress, black tights, and pointed purple hat. Barrel likes looking like a skeleton (even though he’s chubby) and wears a skeleton-themed sweater. All three have different masks on as well. Here’s everything you need to look like Lock, Shock, and Barrel. 1 Red Sweater A plain red sweater is a great top for your Lock costume. 2 Red Pants Match your top with an equally red pair of pants. 3 Black Shoes Lock wears plain black shoes since it matches well with him red theme. 4 Devil’s Tail Lock also has a devil’s tail so wear one as well. 5 Devil’s Pitchfork Don’t forget to bring along a devil’s pitchfork! 1 Purple Long-Sleeved Dress Shock is the only girl of the group and prefers a purple long-sleeved dress. 2 Black Tights Shock wears a pair of plain black tights since she’s always running around a causing mischief. 3 Black Shoes Shock prefers black shoes since it pairs up with her outfit perfectly. 4 Black Gloves Shock also wears a nice pair of black gloves. 5 Purple Witch Hat Shock prefers a witchy look and loves her purple pointed hat. 1 Skeleton Sweater Barrel’s skeleton theme is strengthened with his skeleton sweater. These skeleton gloves will also help. 2 Black Jogging Pants Pair your top with plain black jogging pants. Another options are these skeleton pants. 3 Green Claw Shoes Barrel’s feet are somewhat deformed and looks like it belongs to a green monster. 4 Mask Complete your Barrel look with this Barrel mask! Lock, Shock, and Barrel were performed by three great performers: Paul Reubens (Lock), Catherine O’Hara (Shock), and Danny Elfman (Barrel).